I just realized that my replies to your comments have not been published in the last month or so! My apologies if you have commented and I have not responded. I've been on several chat boards, looked on the Blogger Q and A's, spent the last two days trying things but nothing works. If any of you have had this trouble with Blogger and resolved it can you let me know? PS, that sweet owl is another Ann Wood pattern. My first but not my last owl! I was in LA for a few days. I went down just to catch the closing sale of Claudia Grau, a designer I've followed for many years. She had a store on Melrose in the 80's, then moved to Crossroads of the World on Sunset for many years. She is an amazing designer, always working on new ideas from eco printed cashmeres to one of a kind fabulous textile clothing. Her email said there would be fabric (!) and trims for sale, too. I had to go. And I wasn't sorry. I arrived on a rainy Wednesday morning and was greeted warmly by Claudia. I spent two hours in her studio/shop finding the most amazing collection of fabrics, trims and buttons. I'm writing this post to say that if you are anywhere in the LA area over the next month you should stop by and see what she is offering. Prices are incredible and the selection is so interesting! A peak of the clothing for sale. Beautiful trims. Claudia said she has had the fabric on the right since she was a child! We collectors start early. Vintage Irish linen. No, it wasn't $10 but worth every penny. And Claudia, such a sweet woman! Go if you're in the area and tell her Gayle said hi! And a big thanks to my husband, Joe, for schlepping fabric...it wasn't light! Its Sunday night, (the Super Bowl is playing and I'm trying to ignore it--I bet there's gonna be a LOT of blog posted tonight having to do with sewing). It's 6 o'clock in the evening here on the Central Coast of California and it's still kinda light! Yay!!! Winter is on it's way out...slowly... but even so. I've been cleaning out my work area, stash, old patterns, you name it, I'm getting it into someone else's hands. Feels good. And, I'm using my fabrics; some of them have been hanging around for a long time. More on what I am making with them in a future post. The idea of a hip purse has appealed to me for a long time. I see them on the runway sometimes and think they would be really useful when visiting large cities. I've been diddling around with a few ideas. Most of them have not worked. Some have possibility, one is getting close. I'll show you in order of success, the LEAST successful one first. 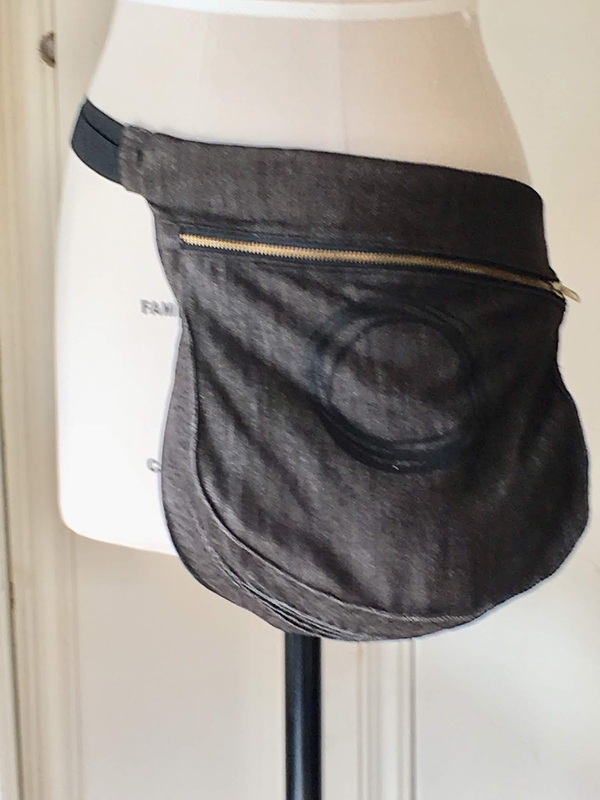 Here is a purse I've posted before but wanted to show you because I love the shape of creel bags and thought it might adapt well to a hip purse. It's made with hand painted canvas so it has plenty of body. 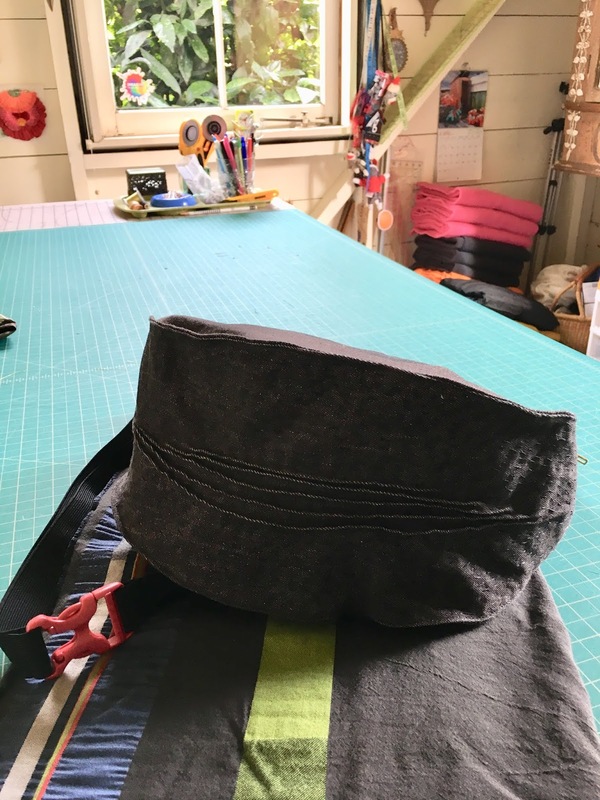 Here is a prototype of the creel bag I thought I could convert from an over-the-shoulder style. This has serious fabric choice issues but then it was only supposed to be a muslin. Its stretch denim, just not enough body. But I like how it looks. I think this one has possibilities. It is a Marcy Tilton purse pattern that is on sale right now on Vogue Patterns! It calls for leather or leather type fabric so it is a bit more detailed than I wanted so I just used the base pattern. The fabric is a mix of two pieces by Miles Frode that are hand stenciled and painted plus a piece I bought from a delightful man outside the Met in New York several years ago. I'm excited about testing this one on the mean streets of Carmel next week when I attend the first ever Carmel Design Outside The Lines. The back; fabric by that really nice guy in New York. This is my year to work on painted fabric. I visited Holly Badgely's studio with my friend, Sharon, for three days. Holly provided such a lovely space, her time and expertise, plus she mixed all of our paints! These are vintage monogrammed linen napkin that I picked up at an estate sale for nothing. They had stains and holes but were meticulously starched and pressed! Hope springs eternal. You can see the black patches, they add so much. I painted them and then created a silk screen to funk it up a bit. I love them, monograms, mended holes and all. I overdyed another set of napkins and then stenciled them using Holly's stencils. I am really excited about this direction. I love making utilitarian things. These small homewares are right up my alley. I know, this post is all over the place. It's just that it's been so long since I posted. Hang in there. My handwork of choice for the last few years has been coasters, again, utilitarian. They make wonderful gifts, and are so fun and portable to make. I made these a few years ago and use them in my studio. I made these at an Oregon coast sewing retreat last week. Glorious weather, great friends, food, beach walks...heaven. 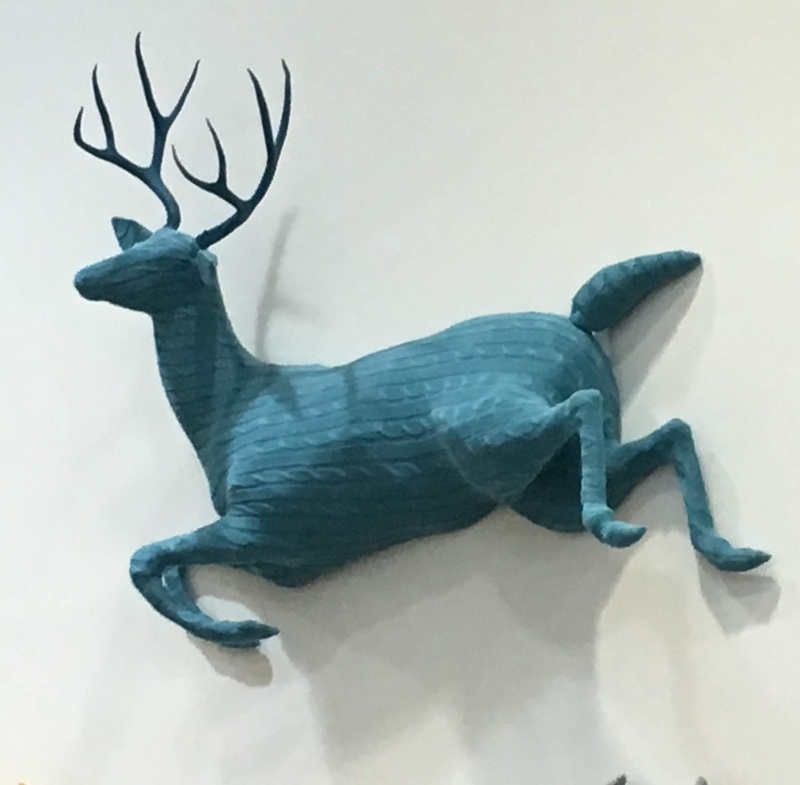 This was just one of the pieces of fiber art in the Portland airport. It seems like I'm seeing more textile art, does it seem that way to you? And I just have to end with my latest Ann Wood bird. An owl, actually. My first, not my last! The next one's tummy needs to be fatter! Get ready, there will be more birds in the future. Just saying. Thanks for visiting my blog. I started it to show my friends what I’ve been sewing. Also to stay in touch with my incredibly rich design and sewing pals around the states.